August. It's hot, it's humid and most people are either on vacation or in a vacation state of mind. 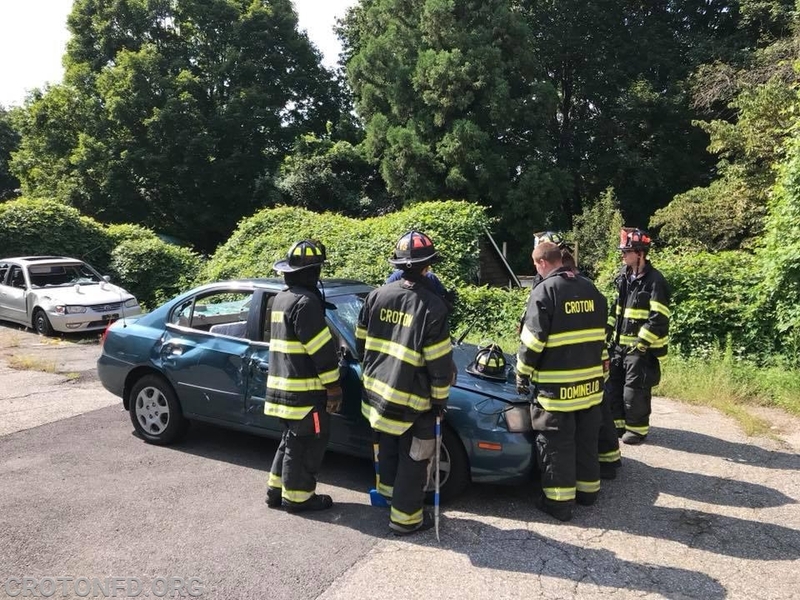 But for the dedicated volunteers of your Croton-on-Hudson Fire Department, they kept busy sharpening their skills and preparing themselves for all kinds of emergencies. 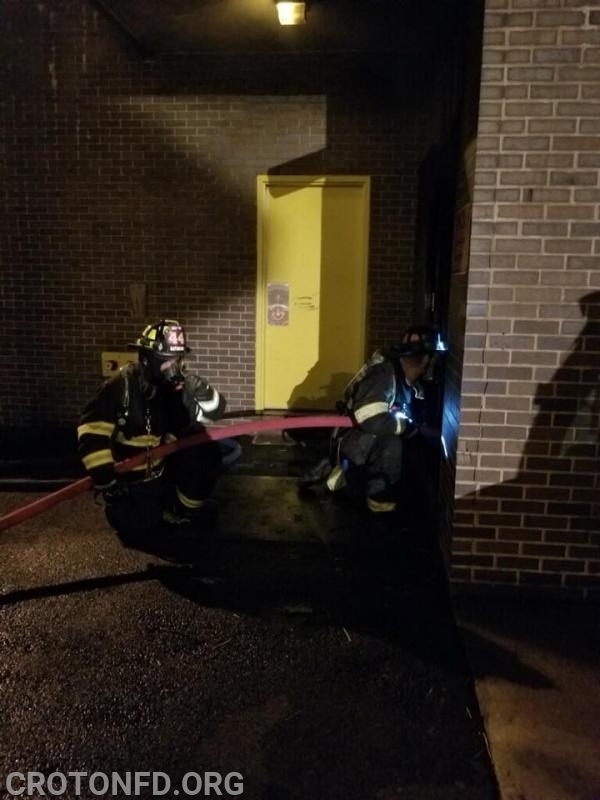 The Department's Training Division - made up of senior members and officers - took advantage of the longer days and usually nicer weather to give our members several different and beneficial training programs. 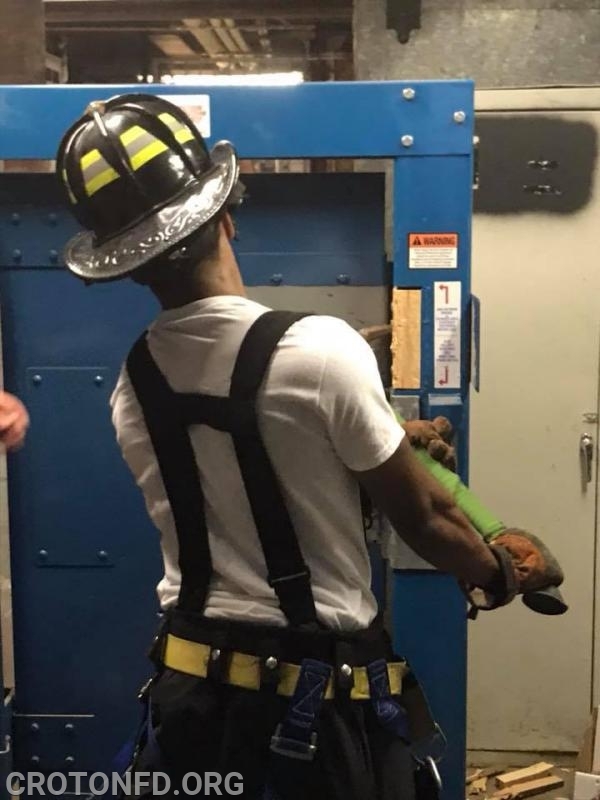 On the evening of August 9th, 15 members participated in a 3-hour drill at Grand Street Firehouse. 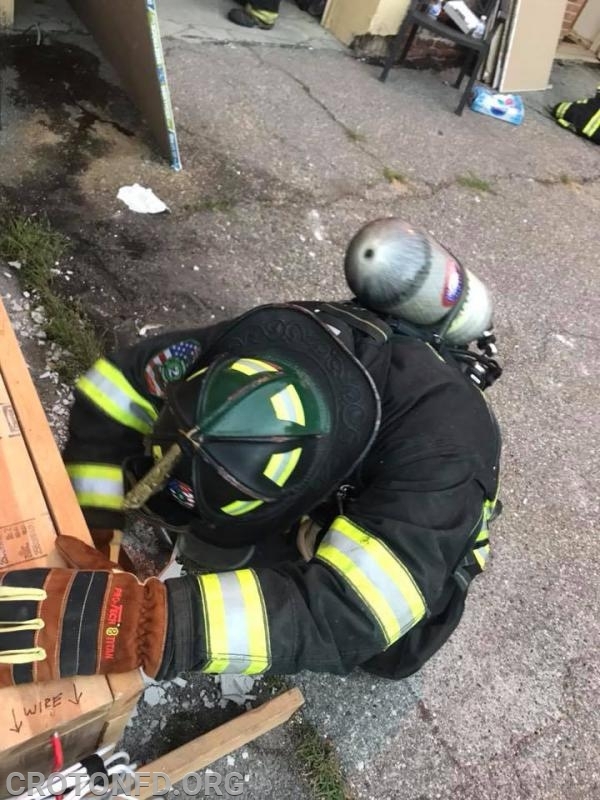 This drill took advantage of our forcible entry prop made by Firehouse Innovations, as well as a wall-breaching prop made by Assistant Chief Munson. 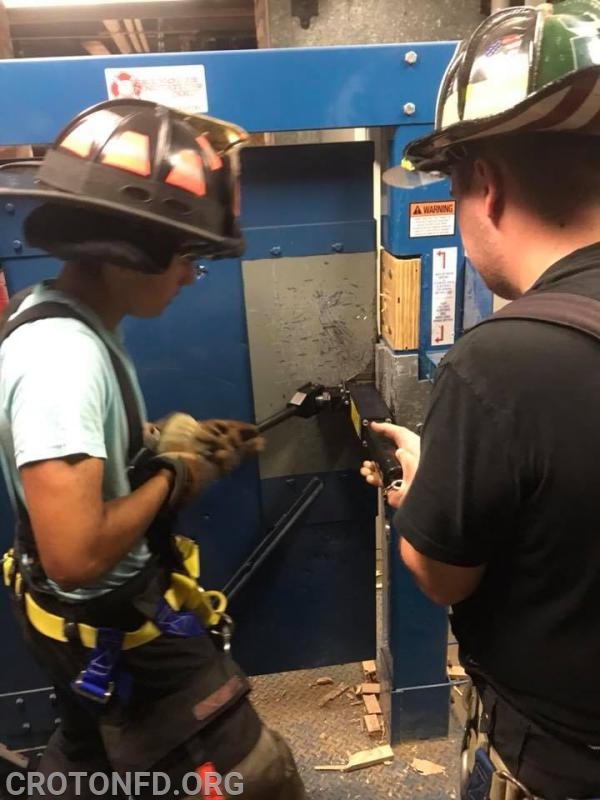 Members took turns forcing open a door using hand tools the hydraulic "Rabbit Tool," and went over how to break through a wall to escape deteriorating conditions in a building fire. 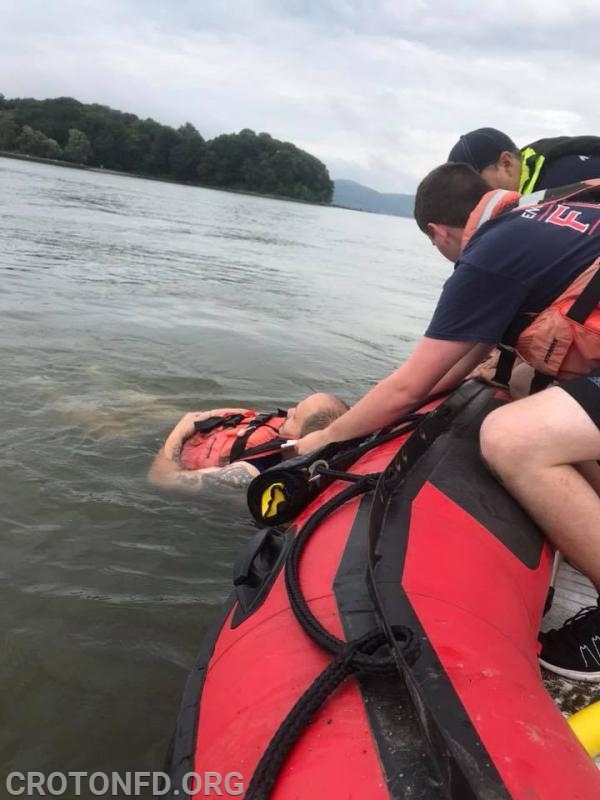 During this drill, we had to put it on pause to respond to a water rescue call in the Hudson River. 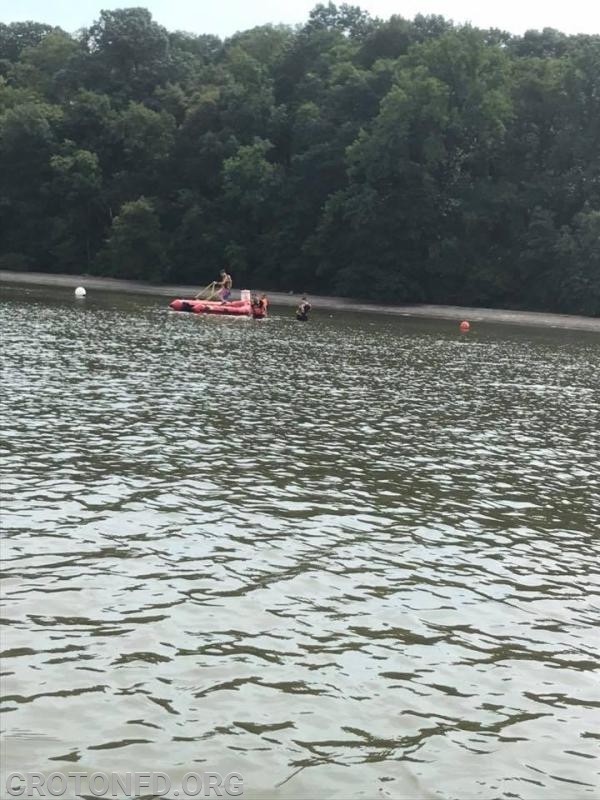 On the evening of August 17th, 15 members took a 4-hour basic water rescue / boat operations class taught by Safety & Survival Training, LLC. 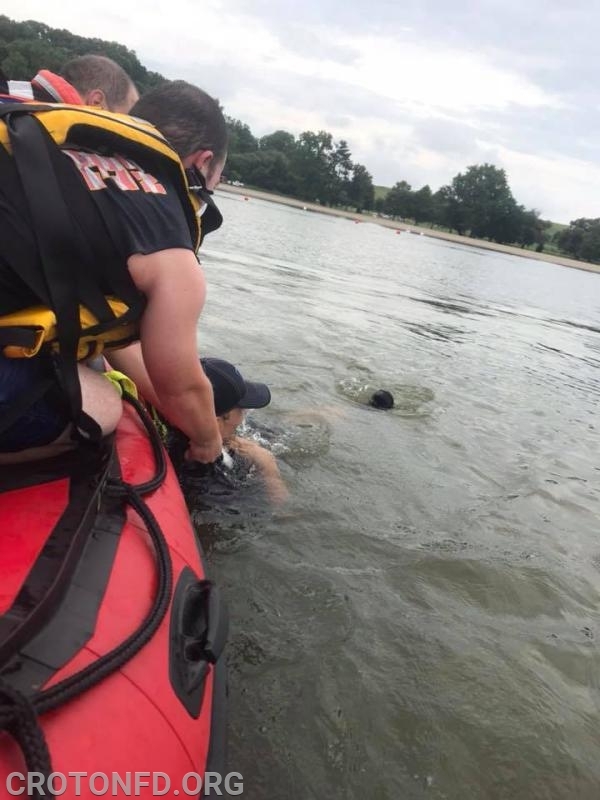 This classroom session reviewed the principles of water rescue and boat dynamics, which proved to be a great refresher for some, and an excellent introduction to newer members. 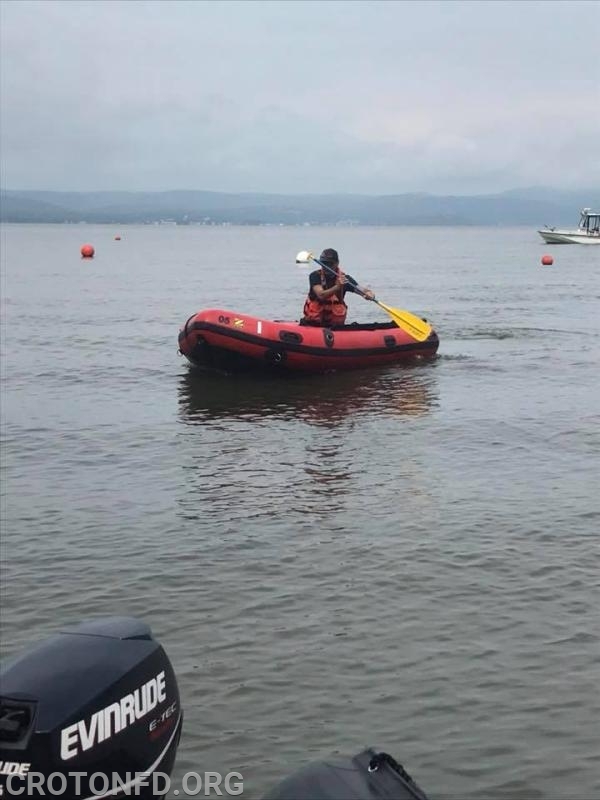 The following day, on August 18th, 11 members completed the 7-hour "hands on" part of the Water Rescue / Boat Operations class. 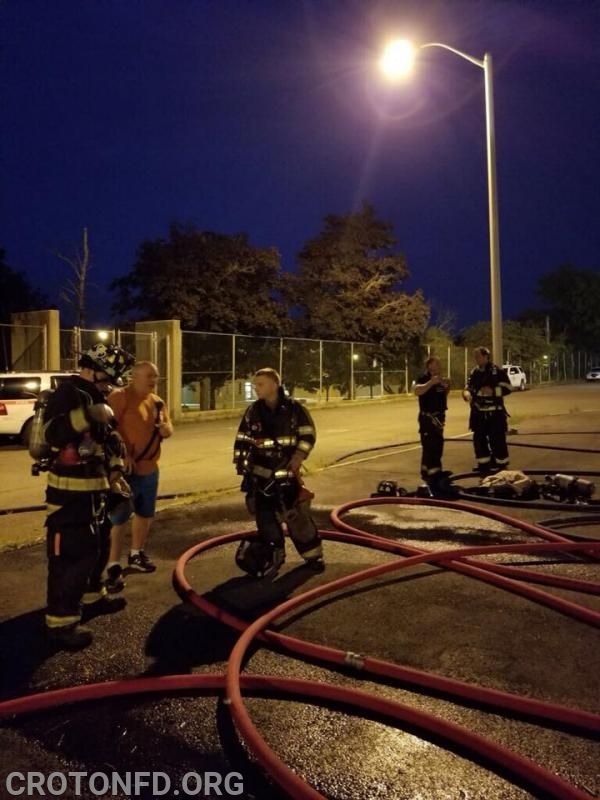 Members went over several boat operating tactics, various methods for rescuing people from the water and more. 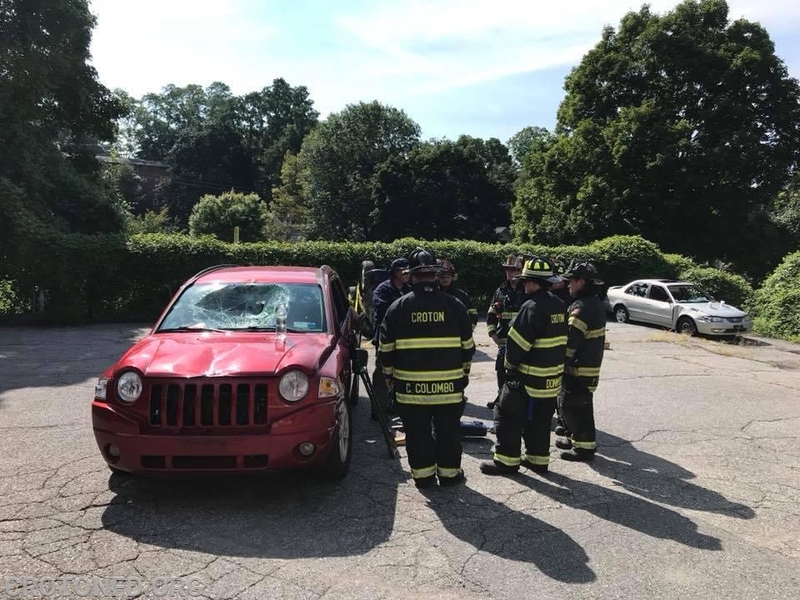 These new techniques will benefit our Marine/Water Rescue Unit and will be trained on by other members. 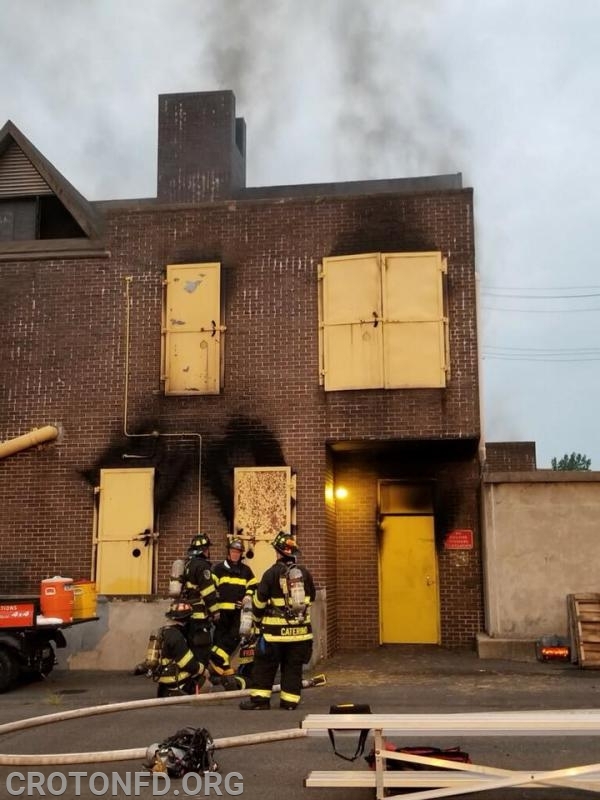 On Monday night, August 20th, 8 members reviewed FASTeam tactics and tools at Washington Engine Firehouse. 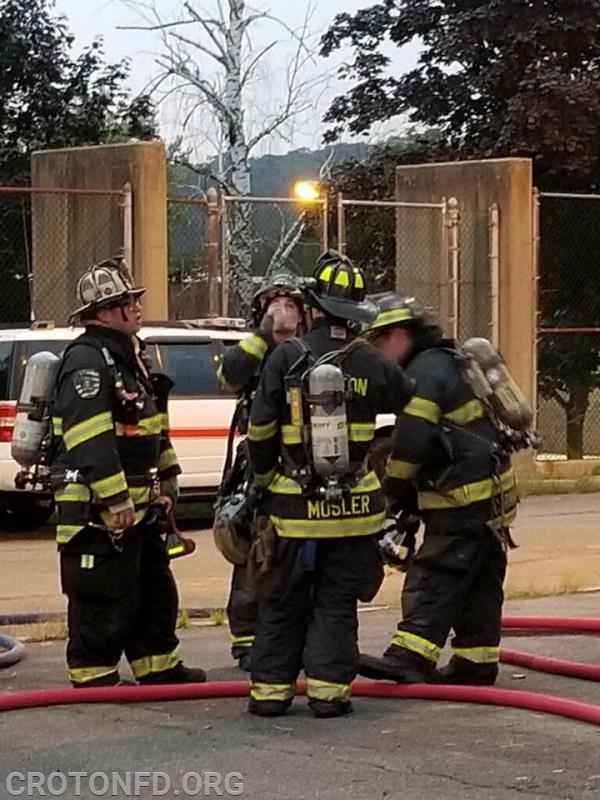 Specifically reviewed were the various rope rescue gear, power saws, Thermal Imager and Pak-Tracker tool. This 2-hour review was helpful for long-time members, as well as new candidates of the team. 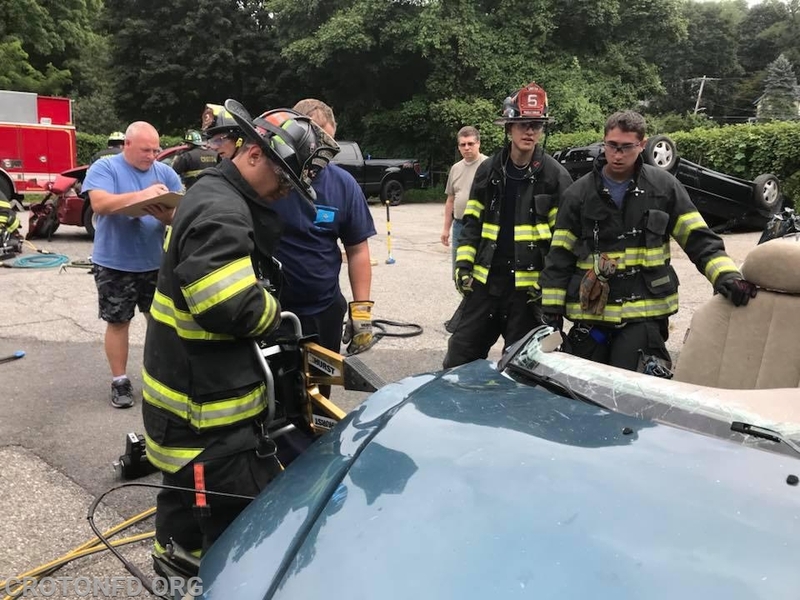 On Saturday the 25th, 14 members participated in over 5 hours of vehicle extrication training, taught by Connecticut Custom Training. 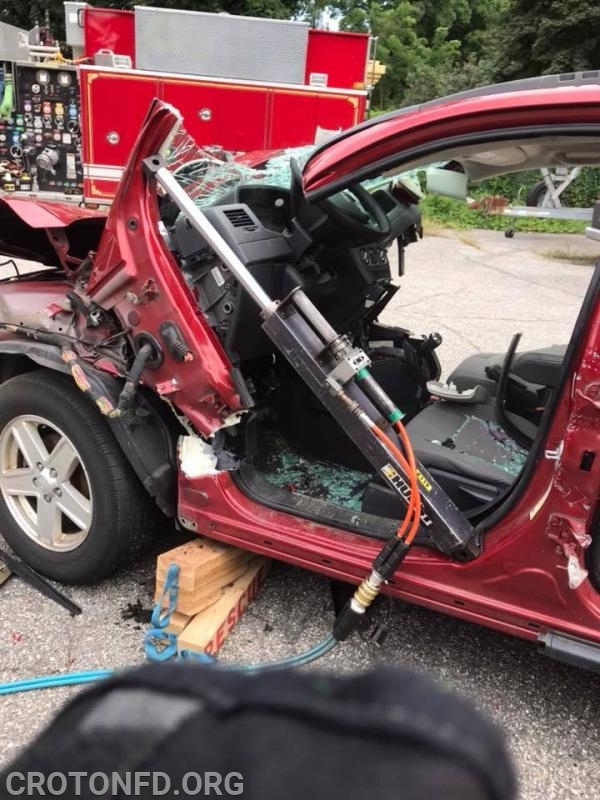 Members began by getting a hands-on demo of the TL9 Stabilization Device, used to lift cars and other large materials off of trapped victims. 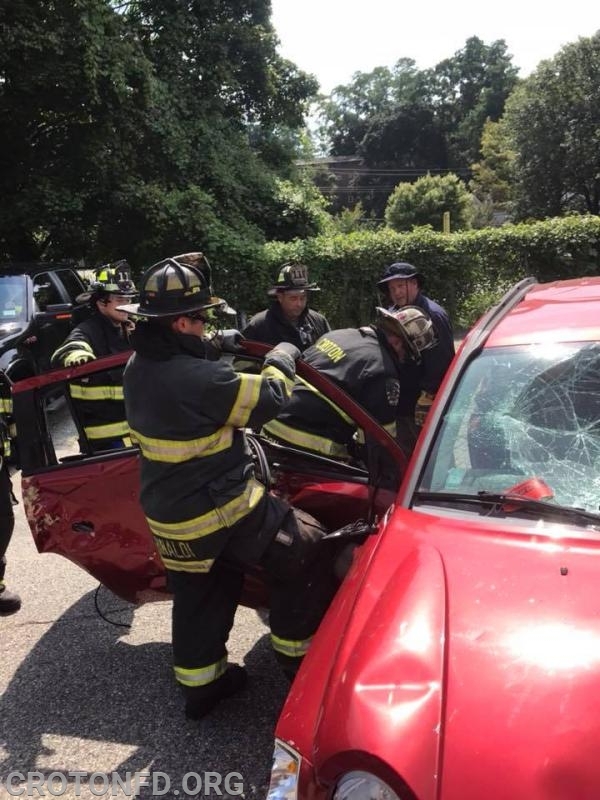 Following that, we went to work cutting up several donated cars behing Grand Street Firehouse. 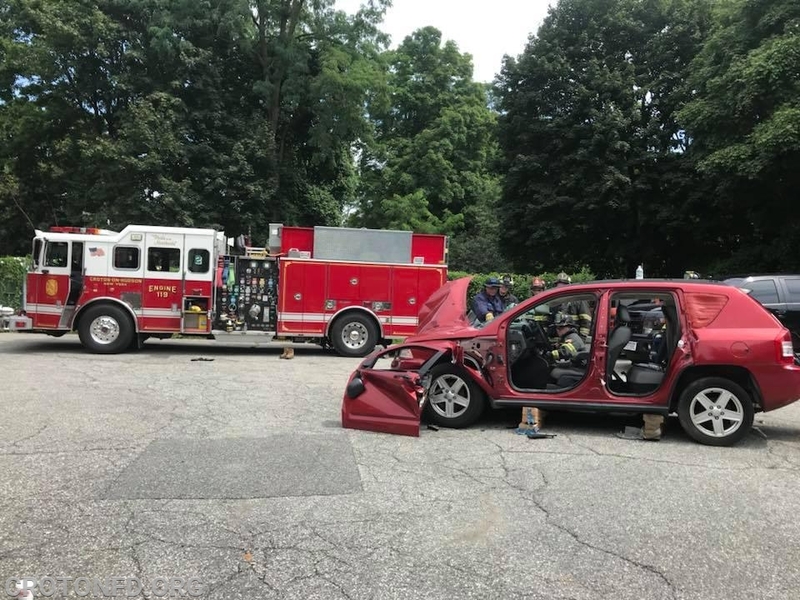 Ironically, once the class ended, our Rescue 18 was heading back to Harmon Firehouse and rolled up on a motor-vehicle accident. Luckily nobody required to be cut out of their cars, but if they had to be, we were well prepared! 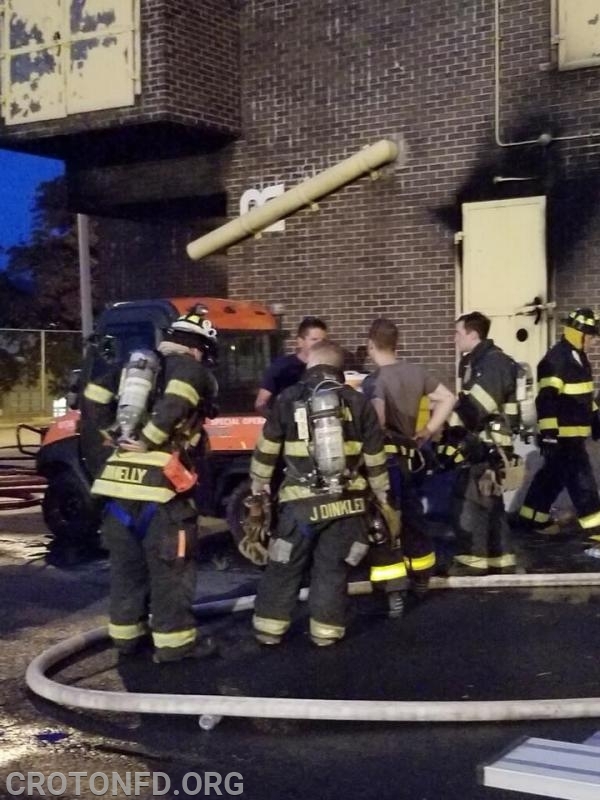 Taking our training on the road, on Monday the 27th, 21 of our incredible volunteers went to the Westchester County Fire Training Center in Valhalla for the evening. 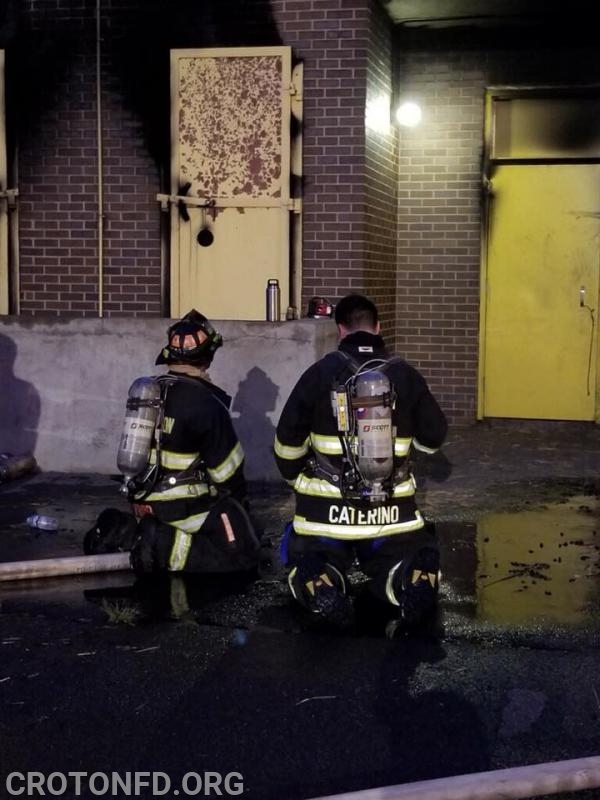 Here, we reviewed Thermal Imager and hose line use under real, live fire conditions. 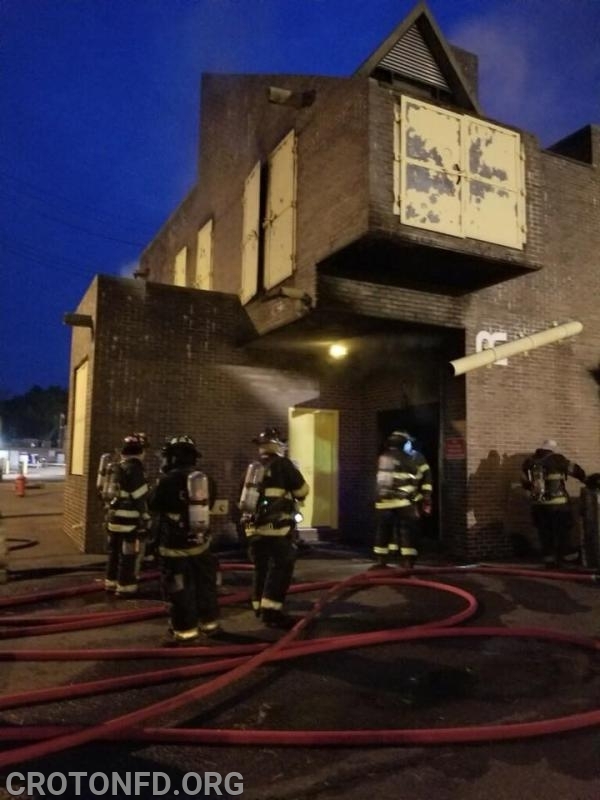 Members worked in teams to see how versatile a tool the Thermal Imager truly is, and then other teams brought in a hose line to extinguish the flames. 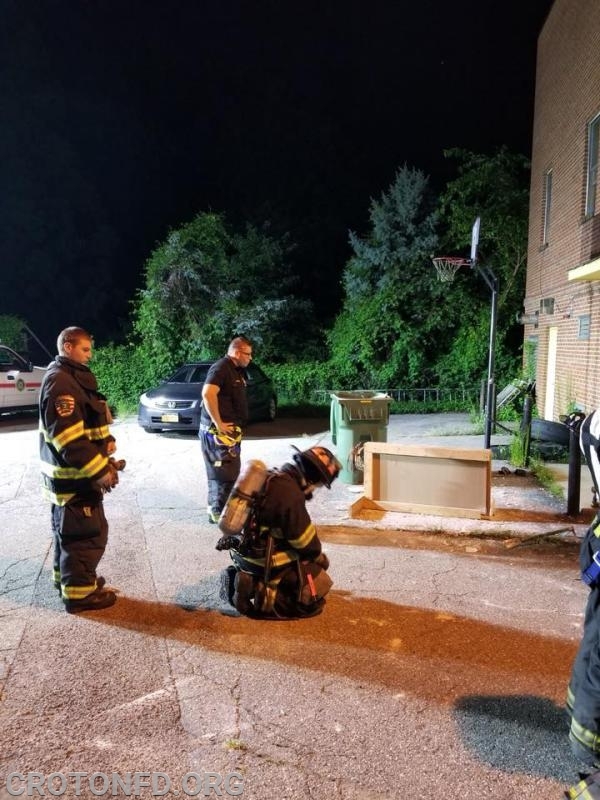 Our thanks to Verplanck and Somers Fire Departments for covering Croton during this much-needed drill. 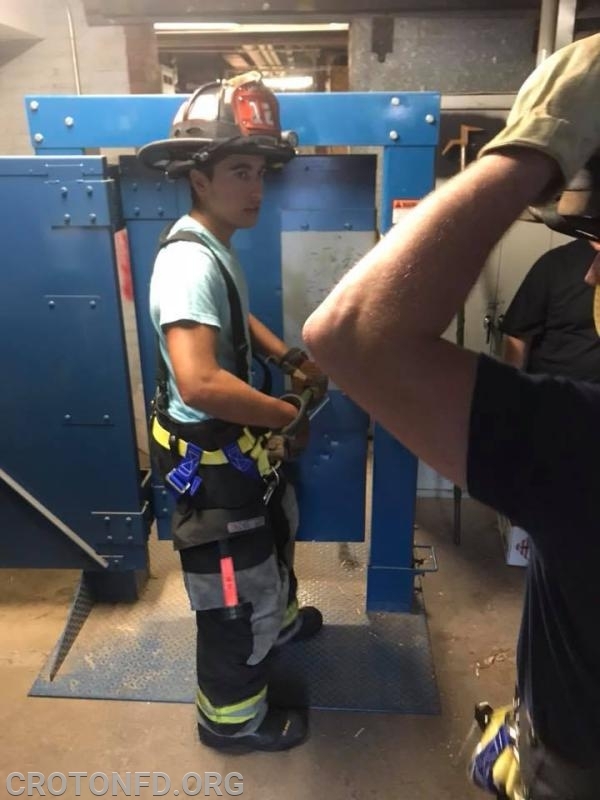 Lastly, on the evening of August 28th, 5 of our members completed their annually required 3-hour Emergency Escape System (Bailout) training. 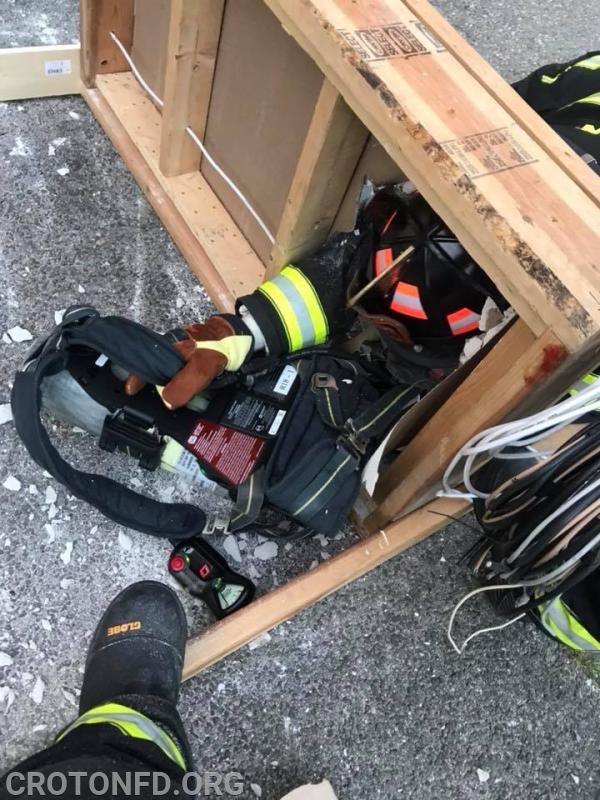 All of our Interior Firefighters are equipped with this Bailout System - which includes a 50 foot rope - so that in the event fire conditions become too bad inside, they have the option to "bail out" of a window and safely descend to the ground below. 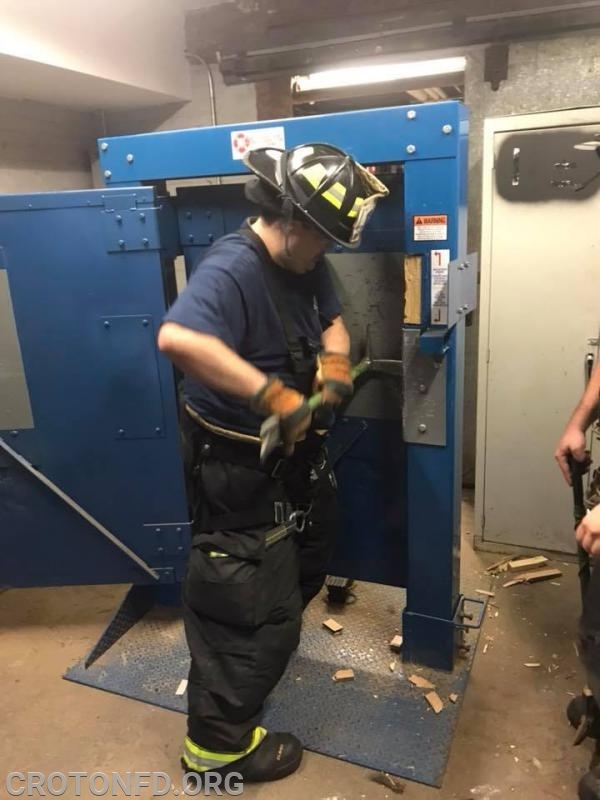 Members receive an initial 8 hours of training on this, and are required to complete a 3-hour review each year, which includes doing four simulated "bail outs." 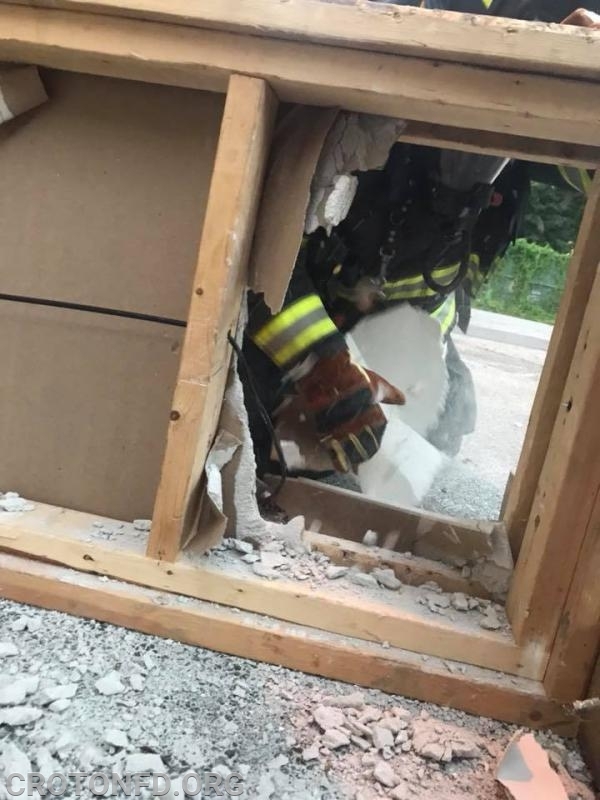 This is done using a truck from AAA Emergency Supply Company under the guidance of their experience instructors. 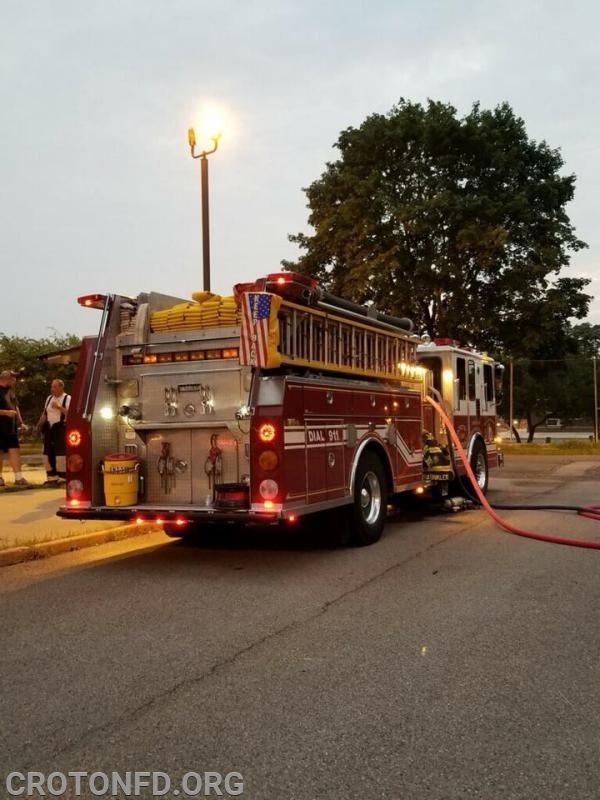 All of this - plus the weekly rig/equipment checks, the company-level drills and of course, the 36 emergencies we responded to - kept our volunteers very busy in August. 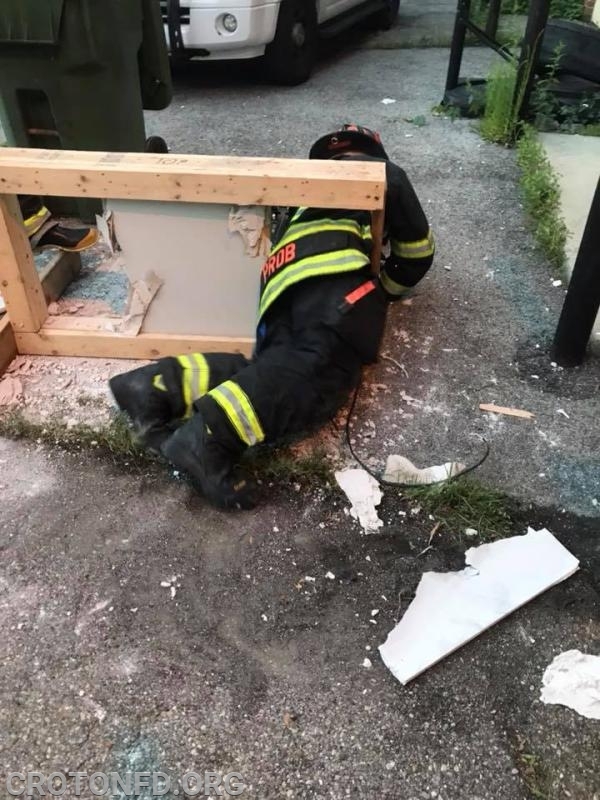 We pride ourselves on our high level of training and dedication, which gives us the ability to answer any emergency efficiently and professionally - completely done by volunteers! 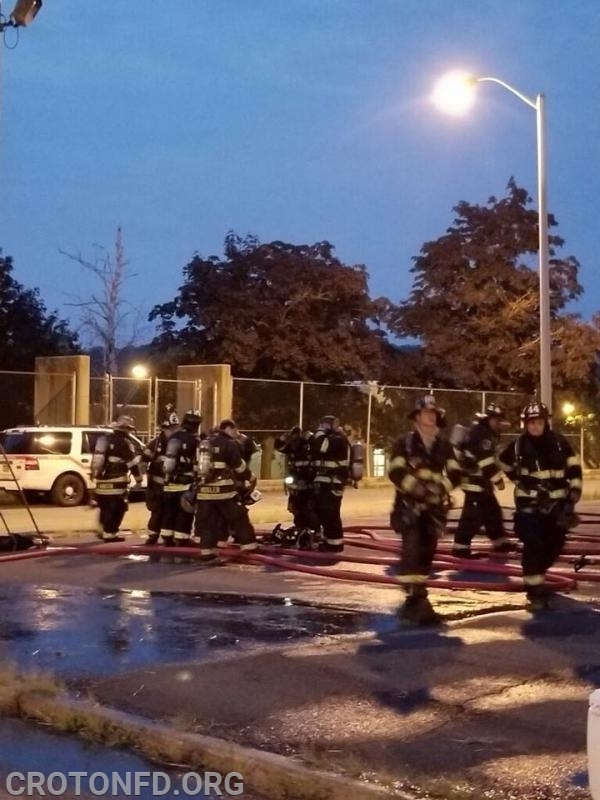 If any of this seems interesting to you, why not give us a try and consider joining the CFD? 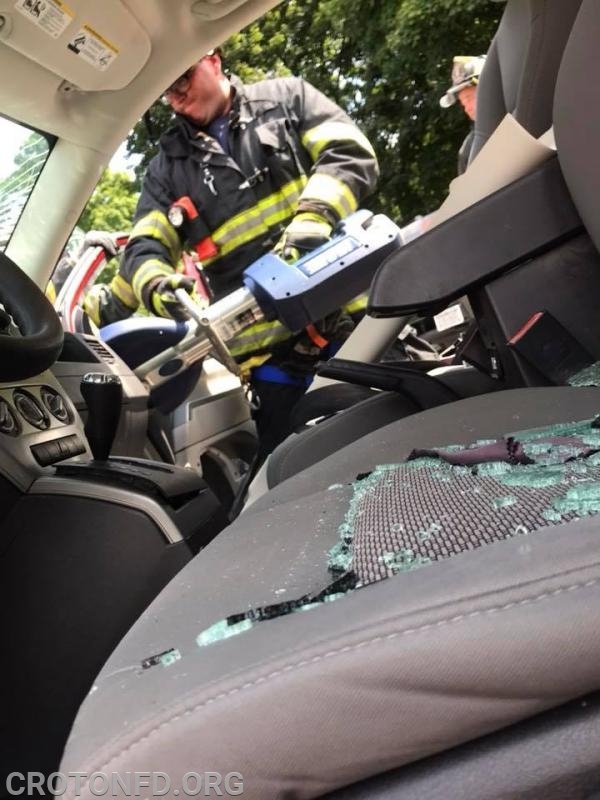 E-mail info@crotonfd.org to find out how you can become one of "Croton's Bravest" today!